Bleach 530 is basically a continuation of the two previous chapters. I’m not sure if there will be a “fourth” part or Kubo will change the title. In this chapter we learned that Masaki Kurosaki is the last of the Kurosaki family. The Ishida family took her in and raised her as a fellow Quincy. As we all know, both the Ishida and Kurusaki clan are Quincies. However Ryuu’s mother has other motive as to why she let Masaki stay with them. Giong back, Masaki was still on her “Holy Training“. I think she’s not that skilled yet as a Quincy. Good thing that Ryuu is good to her, since he knew what Masaki is going through. Meanwhile, on the other side of the town, Isshin is about to face a strong opponent that would change his fate and that of his future son, Ichigo. Isshin tried to lure the “Shinigami-killer” by unleashing some of his reiatsu. Unfortunately, this shinigami-killer is smart. It first attack the two shinigami hiding below. It came without a warning. And here comes the really cool part, the last page of Bleach 530, it made me jump from my chair! The eerie shadow looks like Ichigo in his full hollowfied form! 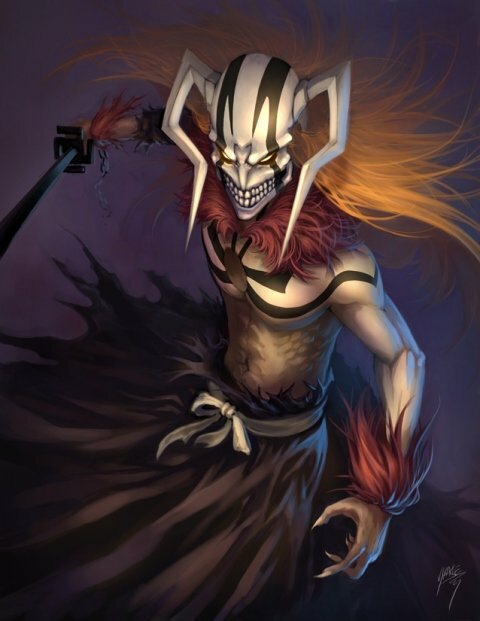 That creature was wearing Ichigo’s hollow mask. Not only that, he has the same speed when Ichigo is in bankai. Because of the last page of Bleach chapter 530, I was able to come up with new theories in relation to Ichigo’s real identity. Stitching up all the pieces, we already know that Ichigo’s mother, Masaki Kurosaki, is a Quincy. But we didn’t knew that she was somehow connected to the Ishida family until this chapter. Next, by now we already knew why Ichigo has both Quincy powers and Shinigami powers as well. And oh, he is related to Ganju and Kukaku Shiba. But with regards to the Hollow inside him, I think we just saw the answer in this chapter. What we still didn’t know if the creature is a Vizard or a Hollow (like an Arancar). It’s definitely not your typical Hollow. It’s way powerful and able to match a captain class Shinigami. Perhaps, this could also be one of Izen’s experiment. But one thing that bothers me, if that was a Vizard, how come it looks different, and who could that Shinigami be. That’s not Shinji, since we already saw what his hollowfied form looks like. Another question is, how did that hollow ended up inside Ichigo? My guess is, after Isshin defeated that creature he might have sealed that hollow within him, or the hollow might have fused with him. But it reappeared on his son Ichigo, as a hollow soul within. Oh well, things are really getting exciting. Little by little, Ichigo’s real identity is being revealed. The Shinigami-Quincy thing is just the tip of an ice berg. There’s more about Ichigo that we need to learn. By the way, the next chapter, Bleach 531 will be released by last week of March, since they are on a week break.